Today's customers are making environmentally friendly products a priority. In fact, one recent survey found that 70% of consumers were willing to spend more for eco-friendly furniture, with most saying they'd pay 20% more for that sustainability pledge. For many, it's not enough to fill one's home with green items; they also want to wear them. Sustainable fashion is becoming more mainstream both in the stores and on the runway. And now, many designers are combining technological prowess with a desire to protect the planet. Case in point: Israel's Ganit Goldstein, who continues to stun fashion lovers with her unique flair and affinity for 3D printing. 3D printers are now being used to make everything from construction-grade concrete to artificial limbs for both animals and humans. It also holds a lot of promise for alleviating world hunger. But this technology isn't all serious. It's also being utilized to create a plethora of products both useful and frivolous, including high fashion ensembles. Goldstein, a recent graduate of Jerusalem's prestigious Bezalel Academy of Arts and Design, has made headlines before -- but her career looks like it's really starting to take off. Her "Between the Layers" collection consists of seven full outfits and six pairs of shoes, all of which are 3D printed using thermoplastic polyurethane and polylactic acid. After being inspired by a study abroad opportunity in Japan, Goldstein created an innovative weaving process using her 3D printer and manual techniques. Notably, Goldstein partnered with Intel to create an augmented reality app to illustrate her creative process. 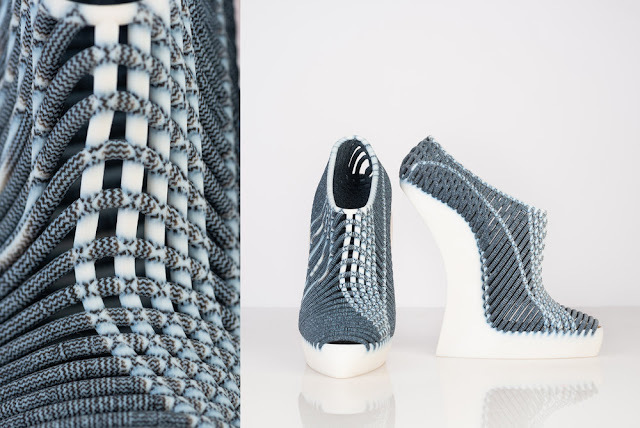 She also teamed up with Stratasys, a 3D printer brand, to develop her sky-high, woven shoes. The footwear is part art, part technology -- and all sustainable. They were first showcased with the collection during the Arts of Fashion Foundation's annual show, but they'll also be exhibited at the Internationale Handwerksmesse in Munich this spring. Of her process, Goldstein explained that "working with the traditional methods, and combining them with new technology, is my vision and my inspiration for my future works." The designer feels that 3D-printed fashion "will change the way people design and wear clothes. 'Personalized, one-of-a-kind' pieces that are specifically created for one single person are the future of 3D-printed fashion."